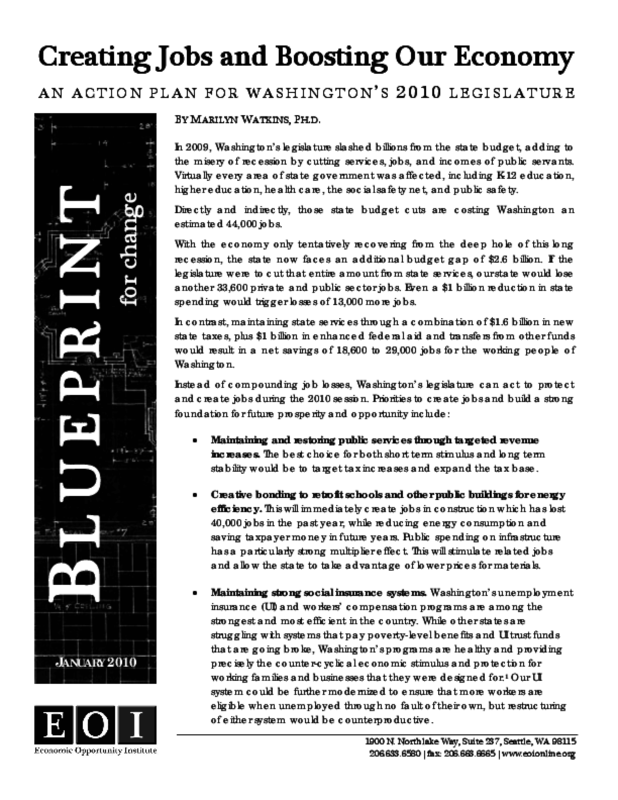 In 2009, Washington's legislature slashed billions from the state budget, adding to the misery of recession by cutting services, jobs, and incomes of public servants. Virtually every area of state government was affected, including K-12 education, higher education, health care, the social safety net, and public safety. Directly and indirectly, those state budget cuts are costing Washington an estimated 44,000 jobs. With the economy only tentatively recovering from the deep hole of this long recession, the state now faces an additional budget gap of $2.6 billion. If the legislature were to cut that entire amount from state services, our state would lose another 33,600 private and public sector jobs. Even a $1 billion reduction in state spending would trigger losses of 13,000 more jobs. In contrast, maintaining state services through a combination of $1.6 billion in new state taxes, plus $1 billion in enhanced federal aid and transfers from other funds would result in a net savings of 18,600 to 29,000 jobs for the working people of Washington.